A substantial number of diseased pine trees in a 5 acre Cathedral Aisle area of Pine Park are dead and need to be removed. Removal will help prevent the spread of disease and reduce the risk of accidents from dead limbs and falling trees on the hiking trails. What is the cause of the poor tree conditions? Kyle Lombard, the Forest Health Program Coordinator with the NH Division of Forests and Lands, believes this is a “combination of needlecast outbreaks in the area and subsequent attack by root rot and red turpentine beetles.” Rhizosphaeara, needle cast, is a common fungal disease that impacts conifers, such as spruce, Douglas fir, western hemlock, and eastern white pine. One of the major factors that leads to this condition is a high density of large pine trees in close proximity to each other competing for sunlight. More information about this disease is available here. Brian Beaty, Dartmouth’s Arborist recently noticed an unusual number of dead pine trees in Pine Park. He contacted Kyle Lombard to perform a site visit and provide recommendations. Who is responsible for coordinating the tree removal? Dartmouth College is coordinating logistics for the tree removal, and is working collaboratively with the Town of Hanover and Pine Park Association. Logging is currently in progress. A staging area with a chipper is located in the parking area opposite the DOC house. More details are on Dartmouth’s Campus Services project page. What is the timing of the work? Removal of the dead trees and related debris will require about three weeks. The project started on January 28, 2019, and is expected to be completed by February 15, 2019. How will the public be impacted by this work? During the removal, the parking lot on the south side of the Hanover Country Club will be closed as it will be used as a staging area to remove the trees. Access to Pine Park along the Esker Trail, Girl Brook Circuit and the Cathedral Trail will also be closed during this time. The eastern part of the Girl Brook Circuit adjacent to Girl Brook will remain open. Areas of the golf course will be closed as well impacting activities such as sledding. There will also be increased truck traffic in the Occom Pond neighborhood and noise from logging activities. How can we prevent the further spread or return of this disease to other trees in the park? 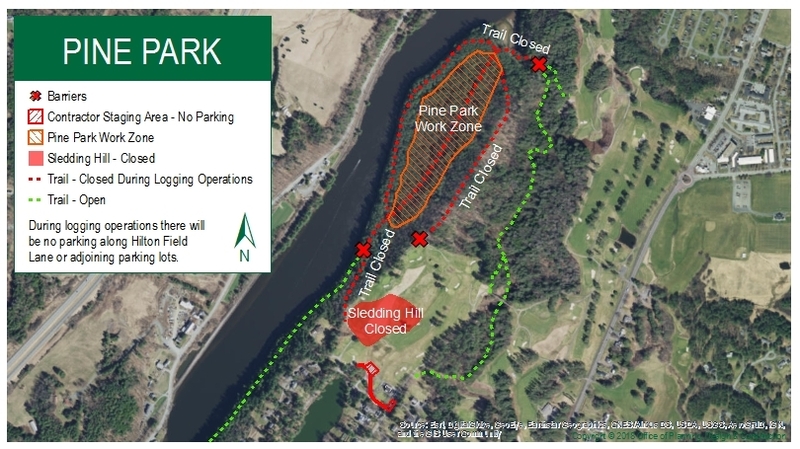 After removal of the impacted trees, there will be further discussions between the Pine Park Association, the Town of Hanover, and Dartmouth about forestry management practices within the park. The Pine Park Association is developing a forest management plan to address the long term impact of this work. Pine Park is owned by the Pine Park Association, a voluntary nonprofit that dates back to 1905. The Town of Hanover and Dartmouth College have shared responsibility for the management of the park, and both periodically offer labor and expertise in connection with its preservation and maintenance. Please explore this website to learn more about Pine Park. Stories have been published in the Dartmouth News and the Valley News. Dartmouth’s Campus Services has a project page. This website is being updated regularly.